Nike keep things traditional on their most advanced Tiempo to date as the seventh generation receives a classic colour update rooted deep into the DNA of the famous and long-serving series. The colourway will be familiar with Tiempo players, due to the fact that the second colourway of the previous Tiempo 6 was also wrapped in black, white and gold. That classic foundation of black and white is what the success of the Tiempo has been built upon, and while the brighter colour palettes will follow in due course Nike still feel it important to please their most loyal players first. Landing as the brand's flagship release of the summer, the Tiempo Legend 7 features integrated Flyknit for the first time, giving an enhanced fit and comfort that is 22% lighter than its predecessor. 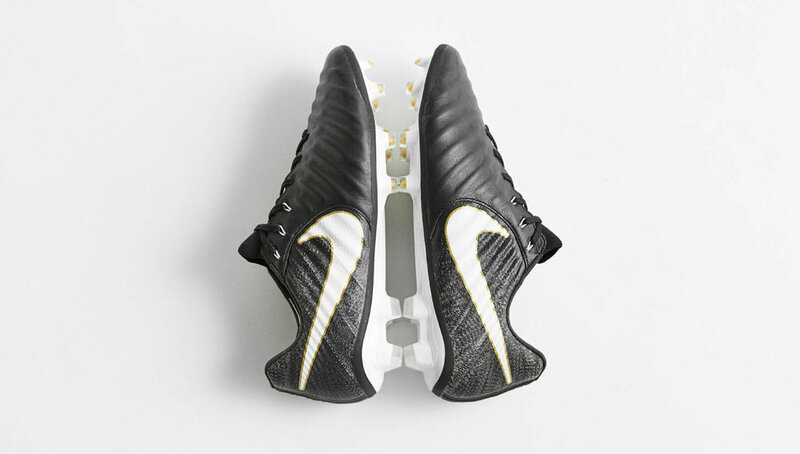 Keeping the Tiempo true to tradition, the boots feature a soft, seamless leather toebox for pure leather to ball contact. To help prevent over-stretching of the leather toebox, Nike have developed Fit-Mesh, which makes its debut inside the Tiempo Legend 7. The leather is also fused with a thin foam that provides the touch and control benefits of quilting sans perforation.